" Enchanting Italy" for a show coming up in March. This is one from my Tuscany trip this past May. I'll be leading another workshop in Tuscany in October 2012 so will get to see Tuscany in a new season. 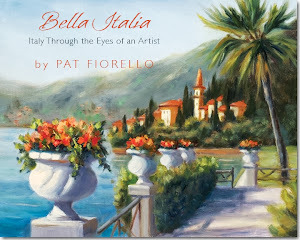 If you are interested in going on a painting trip to Italy check out this link for details or email me at patfiorello@aol.com. There's an early bird discount on registrations by 12/31/11, so if interested, still time to check it out this week. A fried of mine, Aletta de Wal, is the founder of Artists Career Training.com where she offers products and services to help artists "make a better living making art". She and I share an enthusiasm for shattering the "starving artist" myth and we have worked on several teleclass and ebook projects to help artists create their own success. There is no reason for artists to suffer and struggle in the name of their art, when knowing and taking action on some practical approaches, and then being persistent over time, can lead to success. Recently Aletta published a newsletter dispelling some other artist myths. Click on Artist Myths to see tips. Consider sometimes myths are convenient to keep around because they allow us to blame something or someone else or circumstances and not be responsible for our own actions ( or lack of action) and results. "My Real Job is Being an Artist - What You Should Know Before you Quit Your Day Job (or Get One)"
which is due to be released Winter 2012. I had the honor of reading and providing feedback on a recent draft. I have read and own many art marketing books, but hers is by far the most substantive and comprehensive book I've seen on the topic. It delivers no nonsense, practical guidance for artists. I look forward to re-reading it when it comes out and will keep you posted on the release once a firm date is set. In the meantime, this time of year is always a great time to reflect back on what you accomplished this past year, lessons learned and then create goals for the new year. It's easy to forget what we accomplished over the course of the whole year,. We also may miss the big picture when we are looking at what's coming up next. 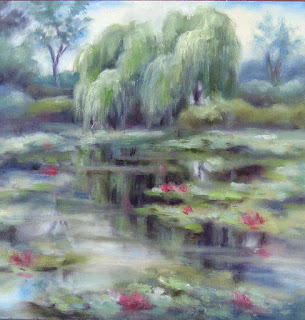 ( including Robert Johnson, Dan Edmonson and Hedi Moran at the Scottsdale Artists School) and painting lots to build my "brush mileage" and skills in oils comparable to my watercolors ( painted over 150 oil paintings) as well as led 2 painting workshops in Italy and my other ongoing classes and workshops. I ended up having my best year yet, despite the challenges of the economy. Often people ask me how I can get so much done- and it is not anything magical or special. It really starts with a plan. If you don't know where you want to go- how will you get any there? Having a plan really helps to keep me focused and also to say no to opportunities that sound intriguing but might really just distractions from the things that are most important to me. If you haven't set your goals for 2012, I'd encourage you to find an hour of time between now and the end of the year and get out a a clean sheet of paper. Imagine yourself at the end of next year looking back- What 3-5 things would you be most satisfied with having accomplished? Write them down. Try to be as specific as possible. If you are genuinely committed to those outcomes( not just a "hope" or "try", then work back and see what actions you'd need to take to get there. Then as Nike says- Just do it! Having a plan in writing that you can see on a regular basis will help you stay focused and true to your dreams. Happy Holidays and best wishes for a new year that's filled with art, success and whatever''s most important to you! Well we are fully in the swing of the holiday festivities. I spent the past few days exhibiting as the featured artist at the Woodruff Arts Center in Atlanta. For those of you not from Atlanta, it's like our own smaller version of the Lincoln Center- an arts campus with Theatre, Symphony and the High Museum- the arts center of the city. The Alliance Theatre performed their holiday classic "A Christmas Carol" and the Symphony featured the Holidays Pops. There were lots of other musical performances in the spirit of the season and families taking pictures in front of the big Christmas tree. Here I am with Scrooge ( aka actor John Curren) in front of the display with some of my paintings in the main lobby. 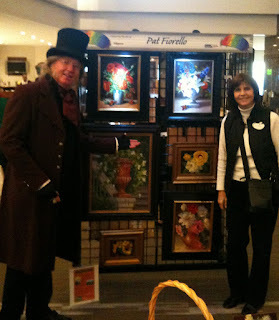 The "Gallery in the Galleria" is a program sponsored by Digital Arts Studio with a portion of the proceeds going to support the Alliance Theatre where they allow local artists to showcase their artwork. My work is more traditional in nature, so I thought it would be a perfect venue for meeting new people who have an affinity for the Arts. I've already had several happy people go home with new paintings and will be there today too for both the matinee and evening shows. This image was based on a photo I took in Italy earlier this fall. Not what you might expect of a typical Italian scene- but I just couldn't resist the lighting. It was a simple garden floral arrangement left over from the previous night's dinner that was still on our breakfast table the next morning. The natural light streaming thru the window created a beautiful play of light and reflections on the table. Did another version similar to my last post. It's interesting when you do the same subject a 2nd time. Sometimes it turns out better because you learned something from the first one. But other times there's a tradeoff in less spontaneity compared to your original response. Perhaps you lose your initial intuitive impulse, over think it or are just more tired so less energy shows up in the painting. In this case I think I like the original better in terms of freshness and bolder brushwork. Maybe the third time (if there is one) will be the charm. 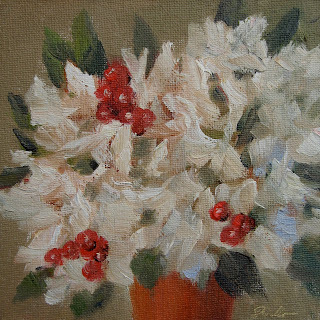 Getting into the holiday spirit, thought I'd do a little" mini "of white flowers with red berries, just to practice some brushwork. Havent been paintings as much the past couple of weeks due to other holiday activities and shows. Its' amazing how fast you feel like you've lost your touch and need to get back in practice. It's all about the "brush mileage". I will be getting some new flowers tomorrow and hope to arrange them and have some time to paint in the afternoon while they are still at their freshest. I tried my hand at an oil painting version of the same set up I did in watercolor for my demonstrations at the Art House Gallery in Buckhead, Atlanta, GA back in September ( see post on Sept 20 in blog archives ). 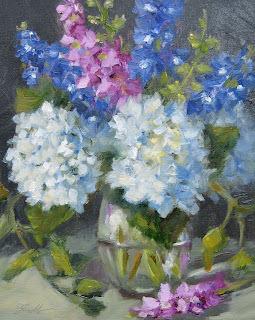 Of course the fresh flowers I used for the demonstration painting are long gone, but I did take a photo to work from. Did some holiday decorating shopping at Pikes Nursery in Atlanta this weekend. Got the usual tree, wreath, poinsettias but couldn't pass up this white hydrangeas. Also bought a flat of pansies for outside and combined the two for a holiday feel. Did a quick still life set up of the flowers before the pansies got planted.